Devil May Cry: A Divine Comedy is like a making-of book for the Devil May Cry games. 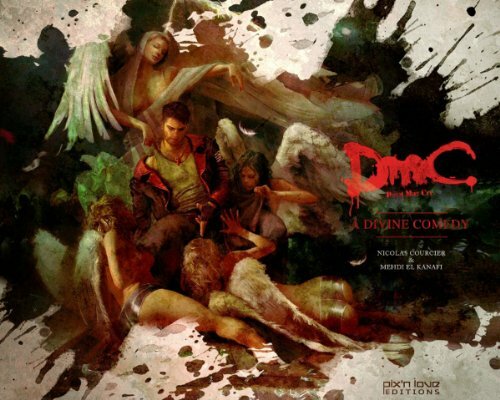 The book was released by Capcom and Pix'n Love Publishing in 2014 to celebrate the successful of DmC: Devil May Cry (2013). It covers the first game that was released in 2001 to the current reboot. The book provides the background to the stories and analysis to the main characters. This serves only as a recap as much of these you would already know if you have played through the game. Highlight of the book would be the commentary on the creation process of the game. It talks about details like inspiration, e.g. like the gothic influence, where The Divine Comedy by Italian poet Dante Alighieri comes in, the art direction from developer Ninja Theory, influence of each game director, namely Hideki Kamiya, Tsuyoshi Tanaka, Hideaki Itsumo, Hiroyuki Kobayashi. The book covers a lot of topics such as reception of each games, the tie-in products such as mobile games, film, artbooks, comics, how the gameplay is designed, themes, how licenses are handled, etc. It doesn't always talk about the good parts but also problems, such as with the stories and other controversies. There's also a chapter on Capcom and how their like to milk their franchise, how they recycle assets like environments and even moves. The visuals included are screenshots of the game, illustrations and pieces of concept art. There are some cool pieces of artworks but that's not the main selling point of the book. You'll find more art in Devil May Cry: 3142 Graphic Arts and DmC Devil May Cry: Visual Art. The book ends with the tablet of contents right at the back. If you have been a fan of Devil May Cry, this is a wonderful companion to go with the games to find out more about the production process.